I just wanted to share what I've been working on this week. I've been slaving over this CUDA ray tracing engine for days and it looks BEAUTIFUL! The past 24 hours have seen a slew of news reports trumpeted by climate change deniers indicating that sea ice cover in the Arctic increased by 60%. I first came across the story this morning when Craig Rucker of CFact.org sent out this info-graphic and accompanying message via email. 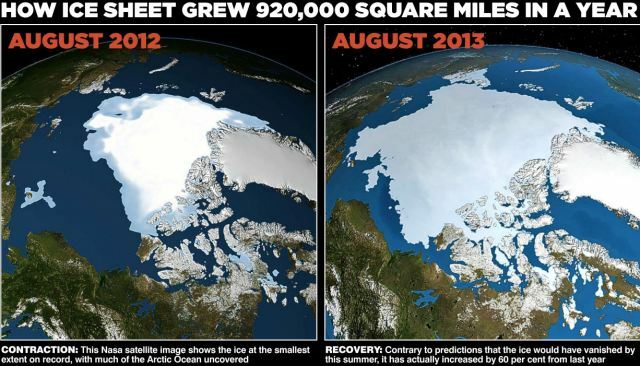 It seems not a day goes by without a new stunning fact emerging which contradicts the UN's global warming predictions. Marc Morano has full details at CFACT's Climate Depot. Click here to get the facts. You'd think that with climate science being "settled" and all, that the global warming folks would be right at least half the time, wouldn't you? The two most commonly sources are the Daily Telegraph and the Daily Mail, two UK papers known the world over for their great science reporting; the Daily Mail even got an award for it. But just to be safe, let's review the data ourselves again. Statisticians have a saying: "torture the data enough and eventually it will confess." Climate denialists have transformed this into an art form. This graphic, created by Dana Nuccitelli at The Guardian, is the most wonderful demonstration of this technique I've ever seen. By reporting trends over small windows of 6 years to a decade, it is trivial to create a series of trendlines that all show global temperatures decreasing over time. 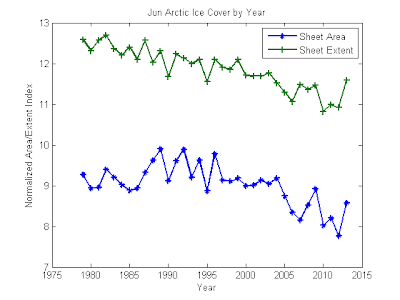 Side by side view of ice extent each month over time. Y-axis is a normalized index from the dataset. Notice the overall downward trend, especially in the summer months. Not a single month has an upward trend over the entire timespan. It can be hard to see the trends in this 1000ft view of the data, so let's compare apples to apples and go month by month. June Ice Extent over Time. Compare the "recovery" this year to the trend and previous recovery years (1985, 1990, 1995). 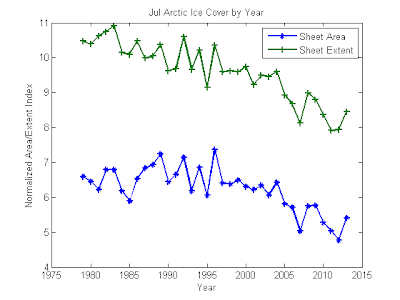 Even back in June we could see a clear recovery in ice sheet extent and area. The magnitude of the recovery is comparable what we will see in August, but expressed as a percentage it is only a 10% increase. As the ice continues to melt through the summer, the difference in ice coverage remains roughly the same but because there is less ice overall (and because we're comparing to an all time record shattering low in 2012) by the time we reach August the percentage has reached 50% by my math. Variation in data sets makes the reported 60% still a reasonable number because we're dealing with such small values. 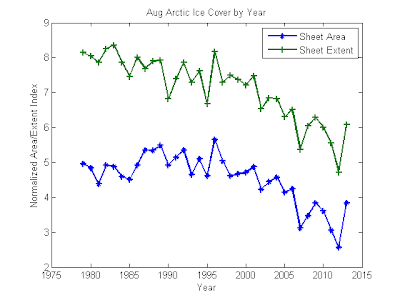 August Ice Cover by Year including the reported recovery. So yes, the fact is there is a larger ice sheet than last year (the 60% number even seems right), but remember that we are comparing it to a record low in 2012. Statisticians refer to this phenomenon as regression to the mean. A common example is the Sports Illustrated Cover Jinx, an urban legend that claims players and teams pictured on the cover of the magazine are doomed to fail in the near future. Given that the players featured on the cover are usually the ones that are already outperforming expectations at the time, it's reasonable to predict that in the near future their performance will drop back to their average. Looking at the data we can see repeated cycles of recoveries which denialists have repeatedly pointed to as trendbreakers or evidence of global cooling. Once again the importance of zooming out on your data for context. Doing anything else is just irresponsible anomaly hunting.